The Beeston Regis Priory (St. Mary’s) remains are situated just next to the grounds of The Priory Maze and Gardens, and the remains of the gable end can be clearly seen from the meadow stream areas. Founded in 1216 by Margaret de Cressy, it lasted until 1538 when Kind Henry VIII banned Catholic religion and ordered the dissolution of the monasteries and priories. After the Dissolution, the building served as a source of limestone and most of the ashlars dressing was robbed. The Priory Gatehouse was probably not added until the late 14th or early 15th Century and the remains of this were recently uncovered in excavation within our Garden in May 2005. 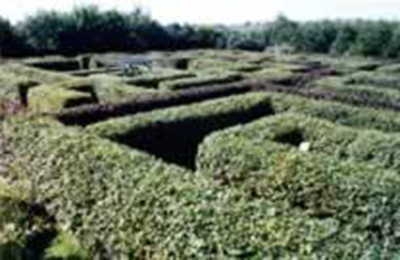 The design and size of the Priory Maze is based on the ruins of the adjacent Beeston Priory. The copper beech copies the layout of remaining ruins, and hornbeam infill’s produce the maze. 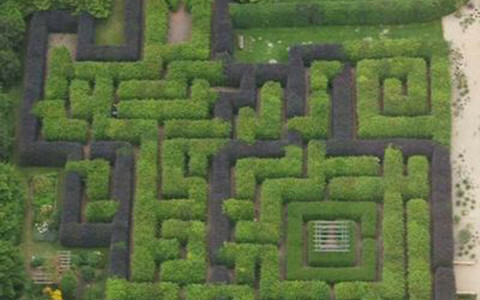 As this is not a symmetrical maze, there is no middle, but the viewing platform is located where the cloister would have been, and gives visitors a birds eye view of the maze and nearby gardens. There is no hidden meaning to the maze, but the series of paths creates merely provides exploration and enjoyment, as you try to find the exit. Quiz packs are available, which helps to keep our younger (and not so young) guests surprisingly amused whilst they learn during their visit.